This critter was on the wall outside the studio where we had our dance lesson tonight. It's some variety of walking stick insect but I've never seen one quite like it before. 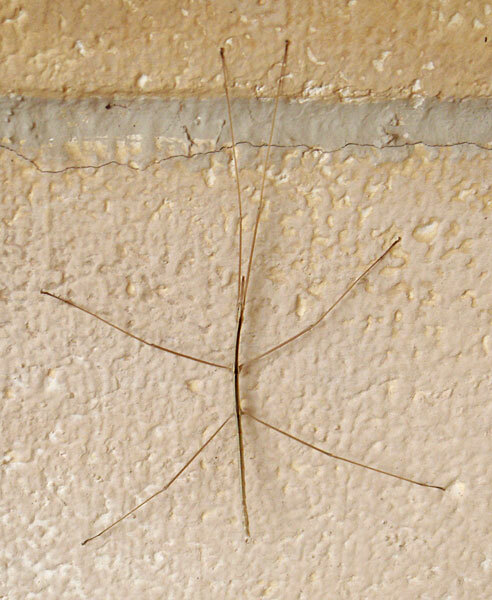 It's about six inches in length, and more delicate-looking than most walking sticks I've seen. It's a Super Model! Poor thing needs something to eat. Did you try feeding it celery sticks? This page contains a single entry by Eric published on September 3, 2009 9:52 PM. Stalking the wily petabyte was the previous entry in this blog. And yet another bug pic is the next entry in this blog.